After decades of rural depopulation, Priorat has changed significantly in recent years. There has been an agricultural revitalization and to a lesser extent, a demographic one as well. This is especially clear in Gratallops, a village of just over 200 people which has become the centre of the Priorat wine industry. It houses the wine cellars of the four producers that began the Priorat renaissance: Rene Barbier, Jose Luis Perez, Carles Pastrana and Alvaro Palacios. 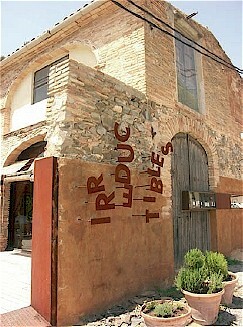 In 2004 a new restaurant, Irreducibles, opened in the village, supported by growing rural tourism and weekend visitors looking for typical Priorat food. "Visitors in the rest of the week, usually knowledgeable individuals attracted by the wine cellars, did not have a location suitable for eating, while tasting the wines. So we created a restaurant with a kitchen and some quality wines which fits with our vision for local products," says Rene. There are gastronomic surprises in Irreducibles because it offers both local dishes and others of more exotic origin. The main culprit is Ricardo, one of two cooks, of Brazilian Asian origin: "I can not make a hundred per cent Catalan or Priorat cuisine. I have come here recently and I like food from around the world. But I pick up the local culinary tradition and try some new products, incorporating and developing them." 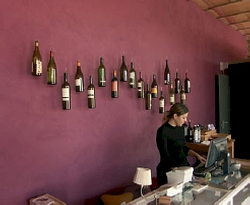 A new restaurant serving high quality foods supported by the best quality wines of Priorat. This is the Irreducibles formula, a restaurant set up in Gratallops by two promoters linked to some of the most prestigious cellars of the county. Linking restaurant owners to wineries has provided both an exceptional wine list and new customers from the world of enology. From the outset, the restaurant has sought to avoid foods that distort the taste of wine. The daily menu is unique, but the dishes change every week or ten days, according to seasonal produce and quantity served, always with a high degree of creativity. It seeks to use products with a maximum of quality and specific backgrounds or elaborations. According to Sara Perez, "each plate, as each wine, has a history behind it, and we must be able to explain it to the customer. " Each new dish, a new experience. And with each dish, a recommended wine from more than 200 in stock, all made in small productions. The restaurant also organizes activities: Saturdays in summer offer live jazz; tastings are conducted by the wineries themselves; and a "Wine on canvas" event combines art, wine and food. The owner can frequently be found advising wines to clients. This has a special merit because it is not easy to attract customers nor trained staff to Gratallops. Despite many wineries, Gratallops has not yet adapted to this specialised tourist activity and there are still few places offering high quality accommodation. The Community Leader Initiative facilitates and coordinates the interests of tourism and wineries around the wine culture but there is still a long way to go. Adapted from 'El Priorato Vinacoteca y restaurante Els Irreductibles' by Jordi Blay Boqu�, Jaume Salvat Salvat. Universidad Rovira i Virgili.